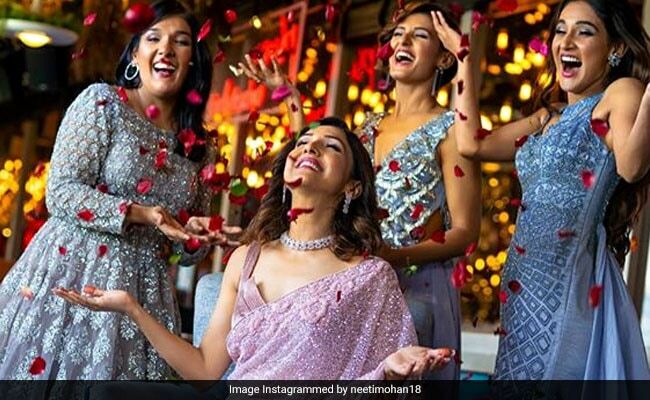 Ishq Wala Love singer Neeti Mohan, who is getting married to actor Nihaar Pandya on February 15, treated her Instafam to some million dollar pictures from her pre-wedding photoshoot just days prior to her wedding. However, Neeti's dreamy pre-wedding photographs are not with Nihaar but with her sisters Shakti, Mukti and Kriti Mohan. On Tuesday, Neeti shared photos from her pre-wedding photoshoot on her Instagram timeline featuring herself with sisters. In one of the pictures, the bride-to-be looked gorgeous in a lilac saree while her sisters were dressed in outfits in shades of blue. "This moment," she captioned the picture with her sisters. In another picture, Neeti Mohan can be seen wearing a blue sequined lehenga. Shakti and Mukti Mohan also shared photographs of themselves with the bride-to-be. Shakti captioned one of the pictures as: "We will not let you go." Earlier, a source close to the couple told news agency IANS that before the wedding on February 15, a mehendi function will be held on the afternoon of February 14 and a combined sangeet ceremony and engagement function will be held on the night of Valentine's Day. All the wedding ceremonies will be held in Hyderabad's Falaknuma Palace. Neeti Mohan made her singing debut in Bollywood with the track Ishq Wala Love (2012), which was part of Karan Johar's 2012 film Student Of The Year. Jiya Re, Saadi Galli Aaja and Sau Aasmaan are some of Neeti's most popular songs.